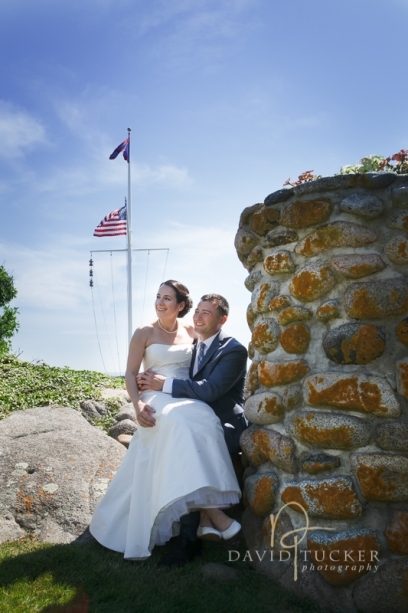 Eastern Point Yacht Club in Gloucester, MA offered a spectacular setting for Anya and Matt’s seaside wedding. Located on the tip of Eastern Point, the views of the Atlantic are incredible and the venue is quintessential Cape Ann. Anya and Matt wanted a relaxed feel where her guests had plenty of time and space to enjoy the views and, as it turns out, the perfect weather. A stroll, a little cruise out in the boat, and nautical themes, all combined to create a picture perfect day. Many thanks to Ana Stefanovich at North Shore Weddings by Ana for elegantly coordinating the event and for all the unique details; a sparkler on the cake, oares for guests to sign and for the bonfire with toasted marshmallows. Please enjoy the photos and join me in congratulating this wonderful couple!